Running through the heart of Downtown Victoria, Government Street is home to plenty of shopping and local history. Along the Victoria Harbour front, the British Columbia Legislature Buildings and the Fairmont Empress are important historical landmarks, both designed by the untrained British architect Francis Rattenbury. 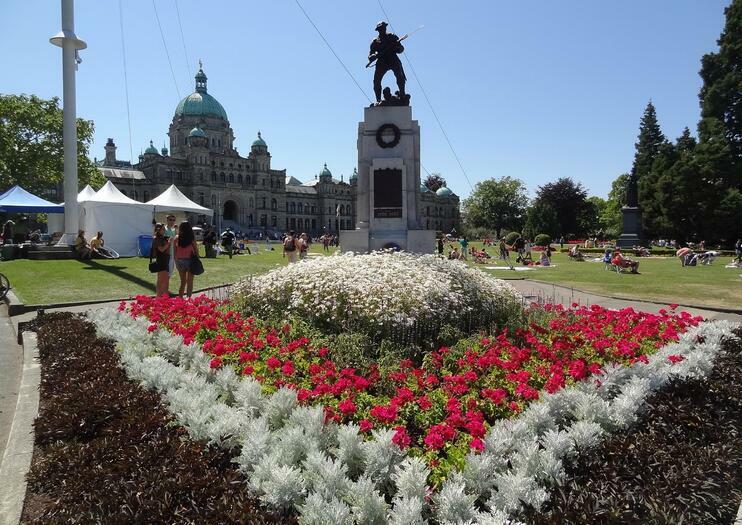 His design for the BC Legislature Buildings, which uses white marble, a massive central dome, and lengthy façade to create an architecturally impressive home for the provincial government, was his first project. This early success led him to be awarded the contract to design the Empress Hotel, which is now one of the oldest hotels in Victoria. Between these two buildings lies the Royal British Columbia Museum, which houses a natural and human history museum and the British Columbia provincial archives. Heading north from the Empress Hotel, Government Street soon becomes an iconic shopping street. Native artwork, high fashion, and a variety of specialty stores holding everything from handcrafted jewelry to handmade chocolate take up the storefronts. More shopping is found just off Government Street, too, including Trounce Alley, known for its European fashion stores; Bastion Square, where local artisans sell handmade arts and crafts; and Johnson Street, which is a local’s favorite for exclusive design boutiques. The corner of Government Street and Fisgard runs beneath the Gate of Harmonious Interest and the entrance to Victoria’s Chinatown. Founded in 1858, it’s the oldest Chinatown in Canada and second only to San Francisco in North America. Government Street runs through Downtown Victoria, between Douglas Street and Dallas Road.